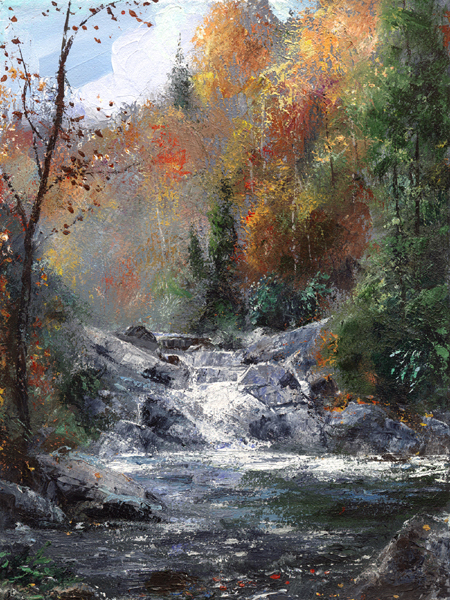 "Highland Falls " is offered as a giclee on unstretched canvas. Image size: 24"w X 30"h in an edition of 250 print. "Highland Falls was painted along Highway 64 near Highlands, NC. "The original was done with painting knives(pallet knife) instead of brushes. This technique is characterized by a rich textural application of acrylic paint on the canvas surface. There is a more dynamic and impressionistic expression of the subject by the artist."